The artistic design of the cast-stone Campania International Vicobello Fountain from Campania compliments any outdoor setting. Water trickles from the upper water spout into the fountain basin to create a relaxing, natural-looking fountain.This unique fountain is charming and distinct and is part of the Campania cast stone collection. This fountain is not sealed, which allows it to develop a natural aged look over time. The Campania International Vicobello Fountain Measures 70 inches tall by 47 inches wide and is 47 inches front to back. Total weight is 873 pounds. All Campania International pieces are stained to order. This process takes 10-14 business days to complete and to prepare for safe shipment. 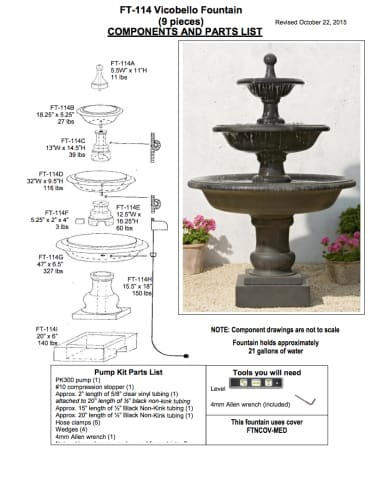 Order the Campania International Vicobello Fountain with free curbside delivery to your home from TheGardenGates.com today.